I have listed a new property at 106 1955 WOODWAY PL in Burnaby. I have sold a property at 1335 - 1337 WALNUT ST in Vancouver. KIT'S POINT! 4 LEGAL UNITS revenue property on a non-through tree lined street in one of the City's most desirable neighborhoods. West facing backyard, 33x100.5 RT-9 lot. Renovate and take advantage of the size of this 3075 square foot 1912 house as a four unit revenue property, your own residence with income, or convert to a single family home. Walking distance to the beaches, shopping, restaurants, parks and all the area has to offer. Never a vacancy, this location rents easily and at a premium. Currently there is a top floor two bedroom, a main floor two bedroom and two 1 bedroom garden level suites. Five Electric Meters and the tenants pay their own heat. 2015Assessed value $2,200,000 Great opportunity to own a piece of Vancouver that pays YOU! every month. Contact Jeff for information package. YOU'LL LOVE IT. I have sold a property at 3565 15TH AVE W in Vancouver. I have sold a property at 203 234 5TH AVE E in Vancouver. Granite Block - 2 level live/work loft space with views of the city & mountains in funky & vibrant Mt Pleasant! Enjoy the super high ceilings, large windows, insuite laundry, gas fireplace. The Granite Block is a well runboutique building with an amazing common rooftop deck in the heart of the Main St. Loft District where you are only steps to all that Main has to offer & just minutes to downtown, transit & the Olympic Village. Parking is on a rotation basis, and 1 pet allowed. If you have always dreamed of the loft lifestyle then this is your chance! Funky. Central. Unique. VANCOUVER, B.C. 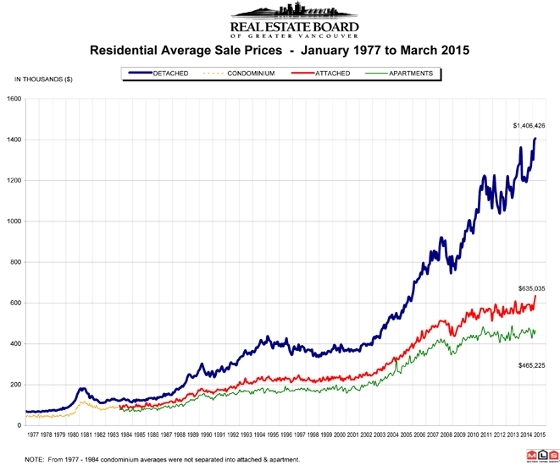 – April 2, 2015 – Demand continued to rise across Metro Vancouver's housing market in March. The Real Estate Board of Greater Vancouver (REBGV) reports that residential property sales in Greater Vancouver reached 4,060 on the Multiple Listing Service® (MLS®) in March 2015. This represents a 53.7 percent increase compared to the 2,641 sales recorded in March 2014, and a 32.6 percent increase compared to the 3,061 sales in February 2015. Last month’s sales were 26.8 percent above the 10-year sales average for the month. New listings for detached, attached and apartment properties in Metro Vancouver totalled 5,968 in March. This represents a 13 percent increase compared to the 5,281 new listings reported in March 2014. Last month’s new listing count was 4.7 percent higher than the region’s 10-year new listing average for the month. The total number of properties currently listed for sale on the REBGV MLS® is 12,376, a 14.5 percent decline compared to March 2014 and a 4 percent increase compared to February 2015. The MLS® Home Price Index composite benchmark price for all residential properties in Metro Vancouver is currently $660,700. This represents a 7.2 percent increase compared to March 2014. The sales-to-active-listings ratio in March was 32.8 percent. This is the highest that this ratio has been in Metro Vancouver since July 2007. Sales of detached properties in March 2015 reached 1,711, an increase of 53.3 percent from the 1,116 detached sales recorded in March 2014, and an 83.4 percent increase from the 933 units sold in March 2013. The benchmark price for a detached property in Metro Vancouver increased 11.2 percent from March 2014 to $1,052,800. Sales of apartment properties reached 1,627 in March 2015, an increase of 47.1 percent compared to the 1,106 sales in March 2014, and an increase of 65.7 percent compared to the 982 sales in March 2013. The benchmark price of an apartment property increased 3.3 percent from March 2014 to $390,200. Attached property sales in March 2015 totalled 722, an increase of 72.3 percent compared to the 419 sales in March 2014, and a 67.1 percent increase from the 432 attached properties sold in March 2013. The benchmark price of an attached unit increased 4.9 percent between March 2014 and 2015 to $484,900.